A large military museum in the west of Moscow that opened for the 50th anniversary of the Soviet Union's victory in WWII, set in a vast park that also features various other war memorials and open-air exhibits. This is not to be confused with the older, much more established Central Museum of the Armed Forces. More background info: The area where the park and the museum are located is known as Poklonnaya Gora, i.e. “hill”, even though it doesn't feel like a hill any more. Indeed it used to be a lot higher, in fact one of the highest spots in Moscow. However, the summits were razed to level the area for the new museum in the 1980s. Before that, the area had been used for celebrating Russia's victory over Napoleon in 1812-1814, for which a big triumphal arch was built. This was dismantled during the 1930s reconstruction of Moscow under Stalin. It wasn't until the late 1960s that the arch was reconstructed on Kutuzovskiy Prospekt (Avenue) next to Park Pobedy. The huge Battle of Borodino Panorama (also celebrating the defeat of Napoleon in that battle) was already opened nearby in 1962. In the latter half of the 1980s it was decided to expand the park and add a museum to the victory against Germany and the Nazis in WWII, i.e. “Great Patriotic War” in Soviet parlance. The tall obelisk outside it was already finished in 1990, but the museum had to wait a few more years. Meanwhile the USSR collapsed and Russia descended into years of political and economic crisis. But in time for the 50th anniversary of the victory in the Great Patriotic War, the museum was completed and opened on 9 May 1995 (i.e. Victory Day in Russia). It was also here at Park Pobedy on that day that the first post-Soviet Russian victory parade was held, in the presence of President Boris Yeltsin. These developments signify a resurgent pride in the Soviet victory in WWII and of all things military in general. In fact both Park Pobedy and the new museum turned out to be much more pompous affairs than the long-established similar Central Museum of the Armed Forces in the north of Moscow. (Do not get the two confused!) While the older museum toned down the glorifying Soviet patriotic slant, here at Park Pobedy it was upped a few notches, including a good dose of renewed Stalin cult of personality (there's even newly commissioned oil paintings of Stalin!). As such, this park/museum complex is perhaps even more representative of the current official line regarding the status of the military and its 20th century history. 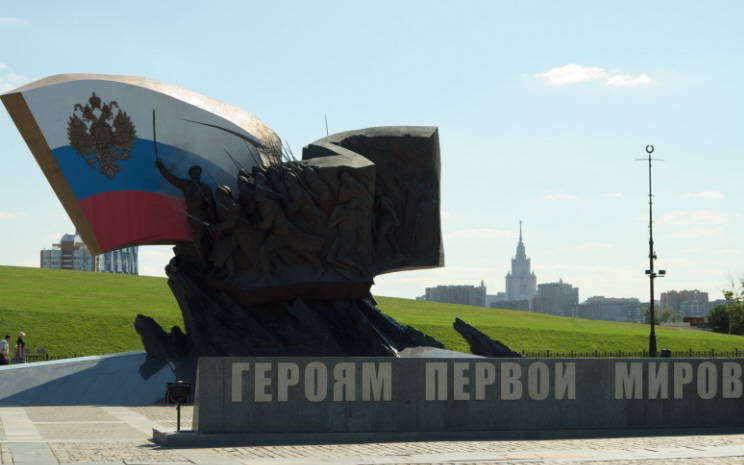 The Central Army Museum also has some less glorious and darker elements (and also covers history much more up to the almost present day) while its counterpart at Park Pobedy primarily revels in the glory of victory in the past. What there is to see: As you get out of the metro station, the first thing that hits you is the vastness of the plaza between the exit and the museum with the central monument. 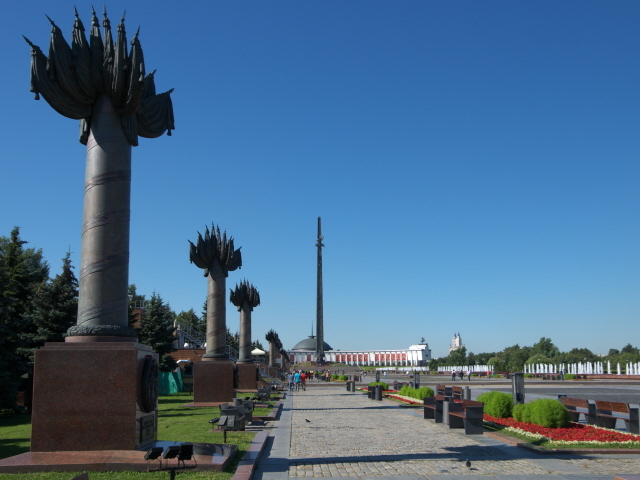 As you start walking, you pass a number of monuments, including one dedicated to World War One, and a whole series of monuments dedicated to individual battles (those 15 columns unveiled by Putin in 2005 along the southern side of the park) and different parts of the military (as well as the 'home front'). The northern line of the approach avenue is adorned with water-spouting features – also a classic design feature, of course. A few steps onwards towards the museum is an eternal flame on a raised marble platform, where several flowery wreaths are placed. Then you get to the ticket booth and after purchasing your ticket you are directed down some stairs into what seems to be the basement but is referred to as the First Floor. 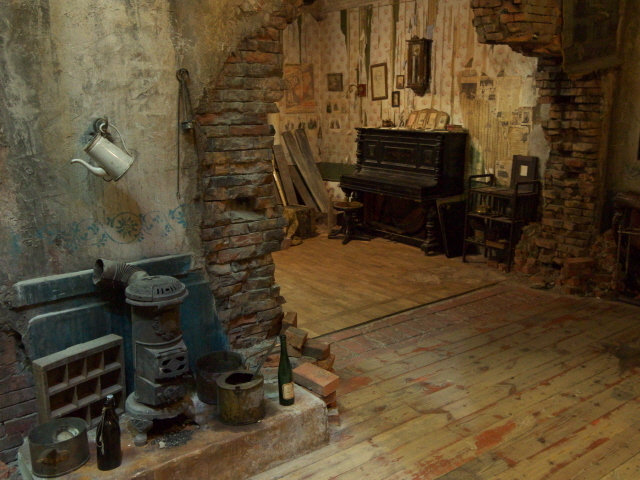 Here is not only the cloakroom (its use obligatory in colder seasons), a cafe, toilets, and a large museum shop, but also the first part of the museum. At its centre is the so-called Hall of Memory and Sorrow. This, as you will have guessed, is to honour the Soviet people who died in the war. A strange dense mesh of chains with glass beads hangs from the ceiling, allegedly symbolizing tears. The marble walls are covered with thousands of names of the fallen – and there are also a few oil paintings – including one of Stalin, dated 2002 by the artist! 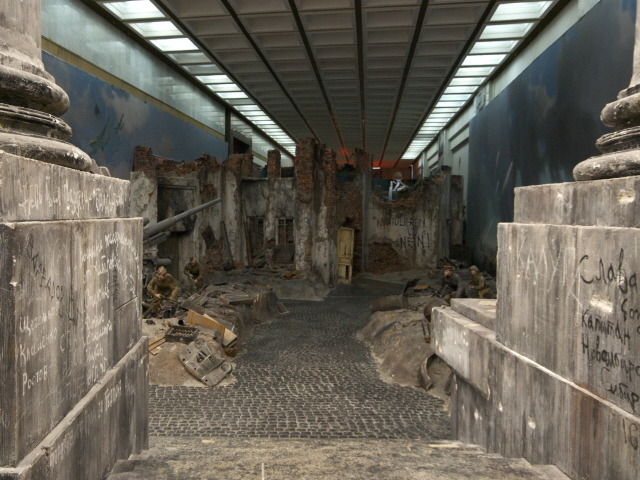 To the side of the central Hall of Sorrow are six panoramas – that typical Eastern European/Soviet art form of war commemoration of real 3-D scenes in the foreground against the backdrop of a curved painting. Here you find dramatic depictions of some of the key battles, such as Leningrad, Stalingrad, Kursk, and of course the final Battle for Berlin. Also on this lower level was a large international exhibition that looked at WWII in other parts of the world than just the USSR and at other players in it, in particular South-East Asians ones, not just Japan (obviously enough), but also e.g. the Philippines, Korea, Malaya, and most prominently: China. The latter part was also trilingual, with Chinese complementing the Russian and English of the rest of the exhibitions. The vastly increased number of Chinese tourists in Russia these days is clearly being catered for! But also acknowledged are the efforts and sacrifices of the Western Allies in the Far East, especially Britain, Australia and the USA. This exhibition also goes beyond the end of WWII and has some coverage of the Tokyo war crimes tribunals as well as of the Potsdam Conference. What I couldn't quite work out was whether this was a temporary exhibition or a new permanent one. On the overview plan of the museum its space was just marked as “exhibition hall No. 1”. 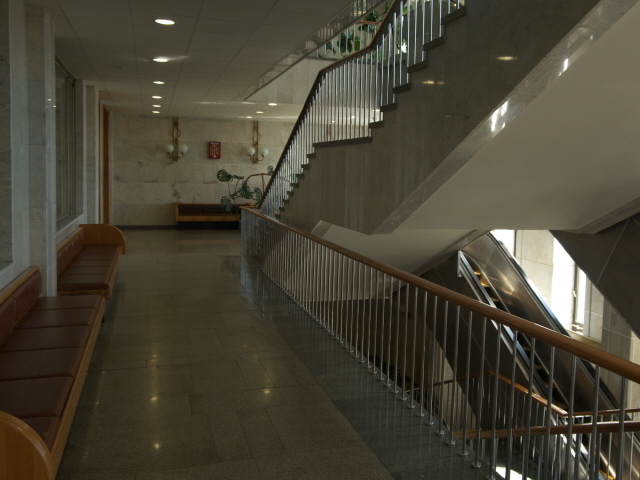 You then have to go up two flights of stairs to get to the Hall of Commanders from where the grand central stairs lead up to the main part of the museum. En route are a couple of smaller extra exhibitions – again possibly temporary ones, although that was not made totally clear. Some of these parts were pretty cryptic to me. (What have soft toy monkeys, Che Guevara, and weirdly-shaped decanters to do with each other? I don't know.) It wasn't helped by the fact that in these sections all labelling was in Russian only. One separate section, however, was interesting for me because a) it was in German and Russian, so I was able to read it, and b) because it was about the surrender of Nazi Germany in Reims, France, and then at Karlshorst, Berlin. The sequence of events generated a number of lasting myths that this exhibition thoroughly and lucidly debunked (e.g. about why a second surrender ceremony was held and about the time delay that caused the signing to fall on 9 May for the Russians, whereas it was still dated 8 May for the Western Allies – see also under German-Russian Museum). The Hall of Commanders features bronze busts of, you guessed it, commanders of the war, and this includes one of Stalin (here he goes again!). 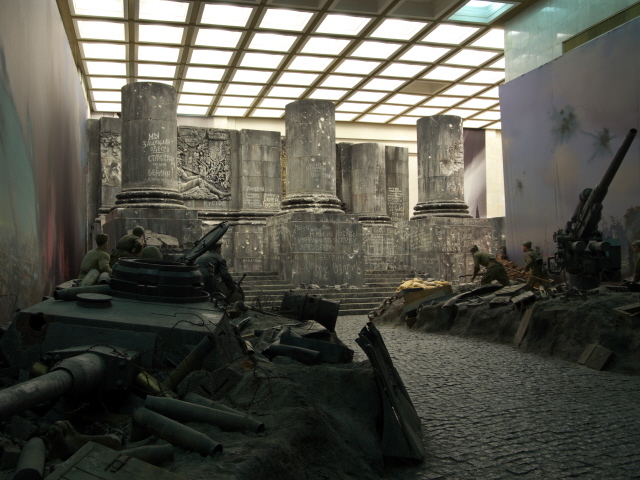 Along the middle of the grand stairs is a bizarre sculpture of sorts: a bronze “carpet” covered with abandoned machine guns and helmets, interspersed with torch-like lights and a big sword in a glass cabinet at the top. Behind this is the entrance to the holy of holies of the complex, the Hall of Glory. 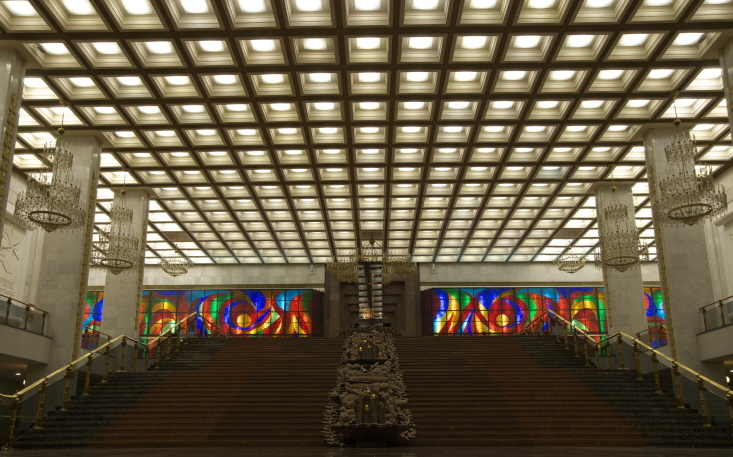 The entrance is flanked by colourful back-lit glass mosaics – it's not in the old socialist-realist style but abstract, so you can tell it's much more recent. Inside the Hall, the Soviet kitsch level gets pushed up another few notches. 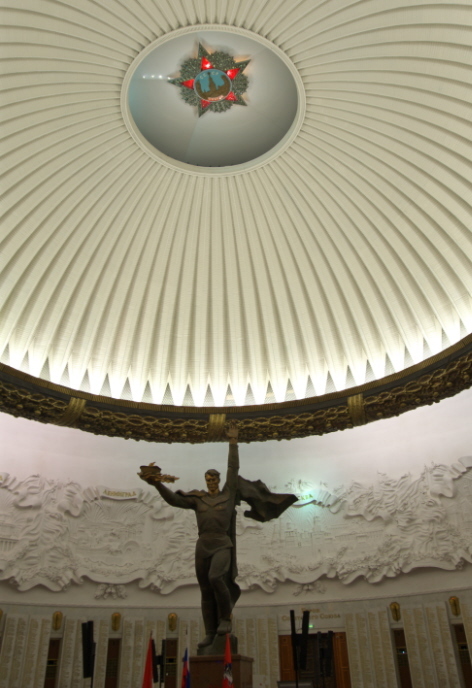 It's a circular domed hall with a star symbol in the centre of the dome which clearly spells out “CCCP” ('SSSR') and the word for 'victory', “Pobedy”. Directly underneath, in the centre of the circular floor stands a bronze Soldier of Victory. The white marble walls are covered with the names of recipients of high-level medals and a frieze above them honours the various 'Hero Cities' of the USSR (Kiev, Minsk, Murmansk, Leningrad, Stalingrad/Volgograd, etc.). To the sides of this central hall are the three main exhibition rooms about the Great Patriotic War (WWII). Since it's not clear which of the doorways from the Hall of Glory takes you to the beginning of the exhibition, it's easy to get it wrong. And I did – suddenly finding myself in the section on the Battle of Berlin. But since I'm sufficiently familiar with the chronology of the war, that didn't bother me too much. I just retraced my steps and found my bearings soon enough. The exhibition is partly traditional, but partly also features some modern elements, such as video projections and even a rather weird interactive hologram installation. But mostly it's display cabinets full of guns, helmets, uniforms, medals, model planes and tanks and the like, plus some larger artefacts such as a row of artillery guns. Amongst the more remarkable exhibits I found a ventriloquist's Hitler puppet especially noteworthy, or the vinyl record with Stalin speeches (I've seen such records displayed at other Soviet-themed museums before and never quite got the point of it – as long as you can't play it, it's just a black disk, so what?). Obviously, from a dark perspective it is the Holocaust section that is of most interest. On display are some of the typical artefacts such as striped concentration camp clothes or children's shoes from Auschwitz (on loan), but also a dented can of Zyklon-B. Visually, however, the most striking section is that Battle of Berlin part. This is basically a walk-through, life-size diorama. 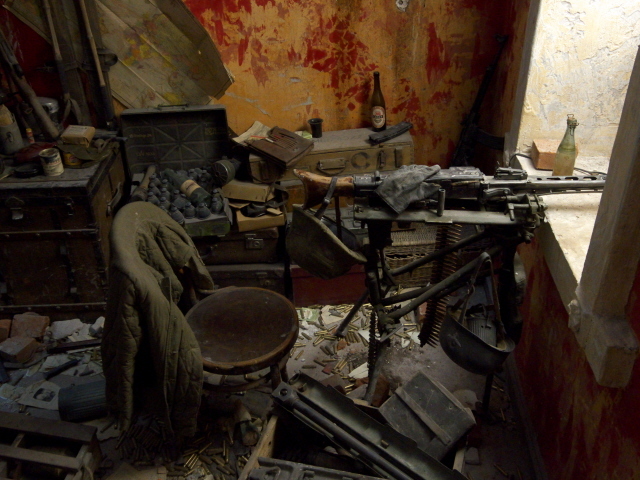 You pass snipers' nests in damaged buildings and a recreation of what a former living room could have looked like in a Berlin tenement house, and then you reach the battlefield, strewn with debris, shells, guns and filled with dummy soldiers. At the far end is a reconstruction of the steps and columns of the front of the Reichstag, complete with bullet-hole pockmarks and Cyrillic graffiti (as was indeed left in large amounts by Red Army soldiers). Outside is a large glass box filled with Nazi flags and hundreds of Iron Crosses spread out over mock stairs – obviously a recreation of the treatment of such trophies by the victors back then, … and still now. On the same floor as the Hall of Glory are also two “balconies” (that's what the museum's floor plan calls them) with two more additional exhibitions. Again I couldn't work out for sure whether these were permanent or temporary. One was about Russia's role in the war in the Pacific and featured a video screen playing testimonies by participants in the battles there. The other included some coverage of post-WWII wars, in particular the final war the Soviet Union fought in Afghanistan and the trauma it caused both there and in Russia (and other former Soviet republics). Finally, back at the museum shop a vast array of gifts, souvenirs, books, plastic scale model kits and such like are on sale. I was particularly stricken by the fact that the latter included a model kit of the Kursk submarine (see Murmansk, Serafimovskoye cemetery and Central Armed Forces Museum). The fact that amongst all the little busts of Lenin, Stalin you could also get a Putin I found also somewhat amusing. But I did not buy anything. All in all, my verdict on this museum has to be mixed. On the one hand it has some stunning examples of Soviet-syle over-the-top-ness in its memorialization (often more than verging on the kitschy), and the Battle of Berlin and the Holocaust sections clearly have their merits, but much of the main exhibition left me rather cold, given its old-school style. I just don't get so much out of endless guns, medals and uniforms, nor out of full-size military hardware. By the way, I have to point out that I did not go to see the open-air exhibition of tanks, guns, navy boats and so on. For one thing they don't excite me all that much, unless they are really exceptional, and also I was already running out of time. And Park Pobedy is so big, you need a day to see everything (but I had an afternoon tour booked that had to take priority). 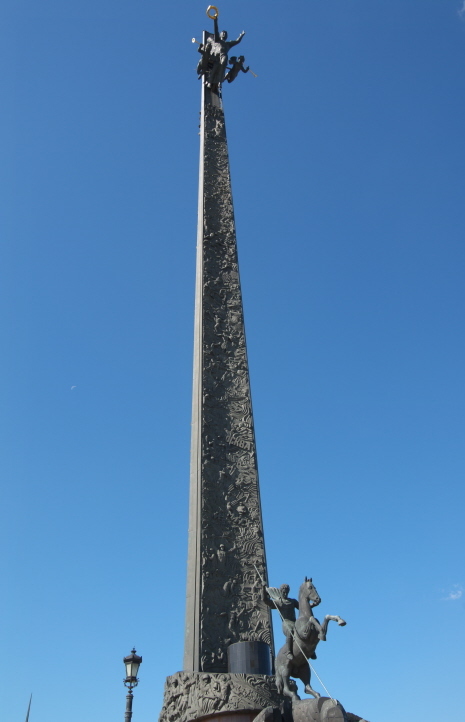 I only had the time to check out a couple of yet more large monuments that are located behind the museum. One consisted mainly of a long row of haggard-looking naked war-time civilians (at first I thought Holocaust victims, but that turned out not to be so). It's interestingly designed in that the figures at the front are quite realistic but the further back the more abstract they become and increasingly angled, like domino stones, eventually disappearing into the ground. Location: quite a bit out from central Moscow on Poklonnaya Gora off Kutuzovskiy Prospekt, some 5 miles (8 km) to the west from Red Square. Official address: Ulitsa Bratyev Fonchenko 10. Access and costs: quite a long way from the centre, but not difficult to reach; fairly inexpensive. Details: The museum and the park are best reached by metro. The complex has its own dedicated station called Park Pobedy on line 3 (dark blue), which connects with the Arbat, the very centre at Red Square (via Ploshchad Revolyutsii) and Kurskaya metro station. From the metro station it's still quite a walk, 0.7 miles (ca. 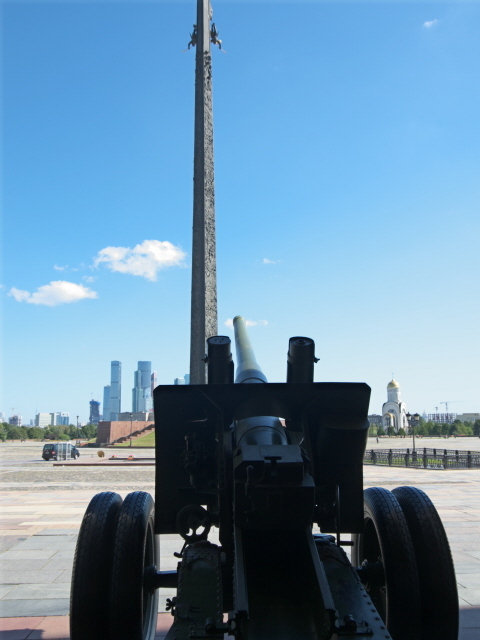 1 km) all the way through the main part of Park Pobedy before you get to the museum entrance. The rest of the park requires a fair bit of extra walking too. As so often in Moscow, it's easy to underestimate the distances and times required to get around. Park Pobedy is freely accessible from dawn to dusk. The Great Patriotic War Museum has the following opening times: Sundays and Tuesdays to Thursdays from 10 a.m. to 8:30 p.m., on Fridays and Saturdays it closes an hour later; the outdoor part closes at 6:30 p.m.; last admission to either is half an hour before closing time. Closed altogether on Mondays. Admission: 300 RUB for just the museum, 400 RUB in conjunction with the open-air displays too (separately this would also cost 300 RUB); various concessions apply, and under-16-year-olds get in free. Time required: depends, largely on how deep your interest in military history and hardware is and also on how much Soviet-style glorifying drama you can take. I suppose one could spend all day here. I gave it about three hours (not including the open-air displays of tanks, etc.). As I said, I did not get to see the open-air exhibition of military vehicles and so on that's associated with the museum and located to the south-west of it. I simply didn't have the time or enough interest in such things. From the photos I've seen it's quite a collection, even including navy boats and a huge artillery cannon on a railway wagon, but otherwise mostly tanks. Those also interested in military history going back further than the 20th century might want to see the large Museum Panorama of the Battle of Borodino (defeat of Napoleon), but otherwise you'd first have to head back into the centre. The one museum most closely related to this one has to be the Central Museum of the Armed Forces in the north of Moscow (metro line 3 to Kurskaya, then line 10 to Dostoyevskaya). Combinations with non-dark destinations: Apart from the non-military parts of Park Pobedy (including a “Luna Park” amusement park), there isn't much of tourist interest out here. However, those with an eye for modern architecture might be keen on getting a closer look at the cluster of recently constructed skyscrapers that make up the city's Business Centre (Delovoy tsentr). Some of these towers are amongst the tallest in Europe and a few are quite striking in design. You can see the towers looming in the distance from Park Pobedy but to get close it's quite a long walk. However, the relatively new metro line 8A (yellow) takes you from Park Pobedy station right into the middle of the cluster. The best views of it, however, are rather to be had from the opposite banks of the River Moskva. The closest traditionally mainstream visitor attraction part of Moscow, the Arbat, is quickly reached from Park Pobedy station too: just two stops on line 3 (dark blue) to Smolenskaya, which is at the bottom end of the pedestrianized tourist mile with its endless souvenir shops, tourist-trap restaurants and all that. Incidentally, Park Pobedy metro station is also of special interest in itself, namely as it is the deepest of all Moscow's stations – the escalator ride is indeed impressive and takes noticeably longer than anywhere else. The station as such, though, lacks the flamboyancy of the old-school Soviet-style deco, despite a few more modern murals. In general see under Moscow.